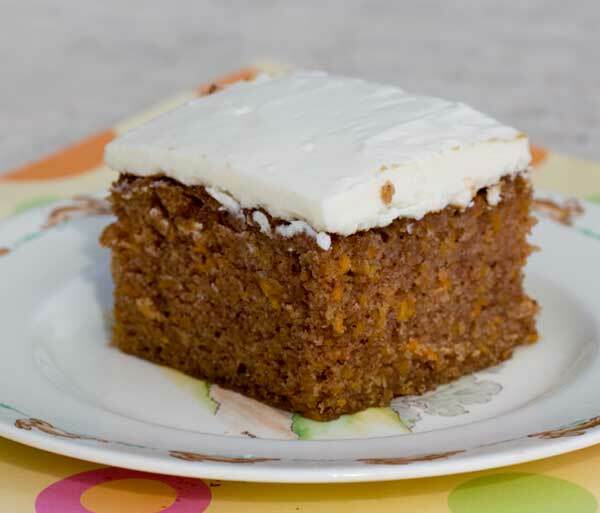 A thick, dark, carrot cake baked in an 8x12 inch glass pan and topped with cream cheese icing. Preheat the oven to 325 degrees F. Grease an 8 x 12 inch glass baking dish. In a large bowl, mix together the flour, baking soda, cinnamon and salt. In a second mixing bowl, mix together the oil, sugar, milk, eggs, mayonnaise and vanilla. Add the dry ingredients to the wet ingredients and stir until mixed. Stir in the carrots. Pour the batter into the pan and bake for 45 to 50 minutes or until cake appears set. It will go from orange to a deep brown. Let the cake cool completely, then frost with cream cheese frosting. The deep yet smaller pan size makes this cake thick. If you only have a 9x13 inch pan, that will work. Just watch the baking time (check at 40 minutes) and expect a thinner cake).